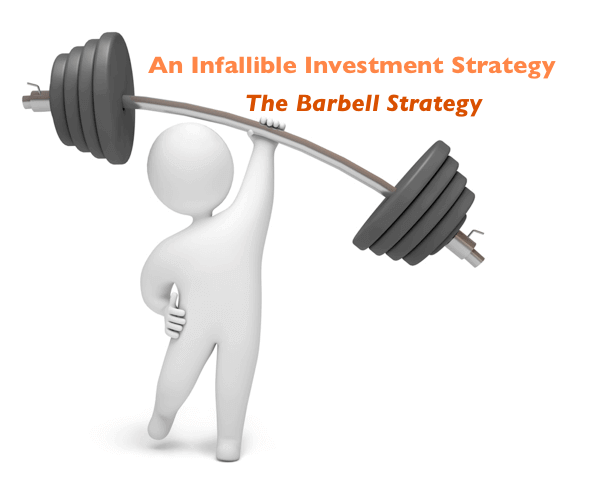 A Barbell strategy, a la Taleb consists of making sure that 90% of your capital is safe, by investing it in Risk-Free assets, which cover from inflation. On the other hand use 10%, or the remaining capital for very risky investments. Few people can coin a new word, and one of those is the options trader, writer, and philosopher Nicholas Nassim Taleb. He introduces the concept of Black Swans and how to deal with that in his three books series called “Incerto.” Before men discovered the existence of Black Swans in Australia, empirical evidence showed that they did not exist. The problem with empirical evidence is that it can only be falsified rather than prove to be right or wrong ultimately. In other words, there will be not a final theory in science, or in socio-economical life, that will be right forever. Instead, a method that works better compared to the previous ones. Until a new, evolved theory, therefore falsify a previous one. It does not mean that the former assumption was wrong, but rather not as complete as the new theory. What does this introduction have to do with investing? The investing world is plenty of gurus, which affirm to be able to read the markets. The problem is that this is not possible, not because they are not knowledgeable enough but somewhat because they are too indoctrinated with their theories and, therefore, they fall into the narrative fallacy. The narrative fallacy is a bias that we all carry, but that the so-called “experts” seem to carry the most. In other words, we tend to give an explanation and create cause-effect relationships between events, which are not related at all. In short, with words we can create stories, those stories fit a narrative, which is deviant from reality. Also, while experts in the domain of physical things, may be really able to have a better understanding of that domain, this is not the case for social areas. instead, if you take 1000 people and you want to measure how the wealthiest person in the world will affect the total, you will be astonished to see that person representing 99.9% of the total. In other words, Taleb classifies our world in two domains, a first domain, called Mediocristan, like the weight example. And a second domain, called Extremistan, like the wealth example. In the weight example (mediocristan), one single rare event minimally impacts the total. In the wealth example (extremistan), instead, one single rare event will make the total. From here, we go back to our idea of black swans. Socio-economics is classifiable as an extremistan domain, where one rare event can make the total. Therefore, the problem here is to understand the difference between rare events, or “Black Swans” which can be classified in “Positive Black Swans” and “Negative Black Swans.” In other words, we want to avoid negative black swans, while we want to completely expose ourselves to positive black swans. But how does this concept apply to finance and investments? To take advantage of positive swans while avoiding negative ones, you have to take an opposite approach in the same domain. In short, you want to cover yourself from blowups while also making yourself exposed to unlimited upsides. This strategy translates into the Barbell strategy, elaborated by Taleb. This strategy mainly consists of making sure that 90% of your capital is safe, by investing it in Risk-Free assets, which cover from inflation. On the other hand use 10% of the remaining capital for very risky investments. Risky investments such as options, or rights but not obligations to either buy or sell a stock in the future. The cool thing about options is the fact that you know the downside beforehand (the cost of the option), although, you don’t know the upside (as Taleb puts it “The sky is the limit”). While this strategy can be used in investing, it can also be used in other domains of life. The interesting theory coming from Taleb’s book is intriguing since it can be expanded to the point of making yourself “antifragile” to life. This new word coined by Taleb differs from robustness. Indeed, while robust things are resistant, “antifragile” things, gain from disorder. In an uncertain, extremistan world, becoming antifragile can be the answer and solution to life’s meanest problems. The Four-Week MBA is an online community. The article above is not meant as an investment advise, but rather as an educational article. For investment advises consulting an investment professional.